We’ve never had a friend like this creep. Folks. Look. The Aladdin trailer for the live action remake looks bad. It looks really, really bad. The costumes seem somehow overwrought, the Jafar the game is presenting is much, much too hunky and, compared to the scenery chewing villain in the original animated movie, kind of seems like he’s going to be dull as dirt. Yet, we knew the worst was yet to come, and here it is. 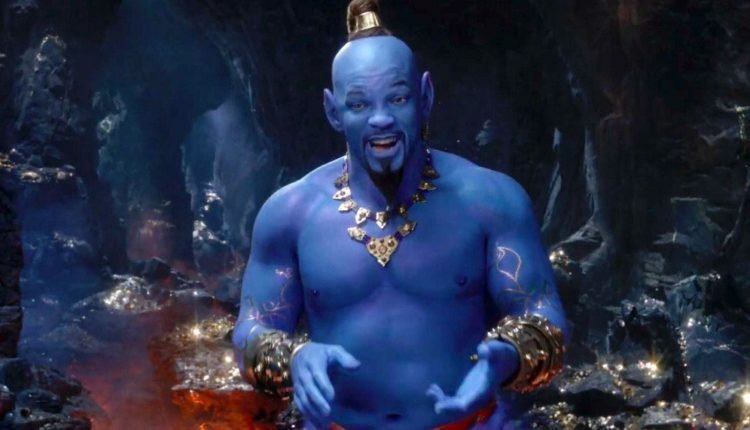 Folks, they revealed the new blue genie in the remake, as played by Will Smith. And folks. Absolutely no one is warming up to this abhorrent freak of all nature. Check out some of the reactions below. So look. The Will Smith Genie looks unnatural and freakish. One of those things that looked a lot better on the animation cel and voiced by the unforgettable Robin Williams. It might have been better to let the character do his own thing rather than leaning into something that a comedian who could not be more different from Will Smith did. Well, whatever. Let’s watch the original animated Genie just for fun. Back when Genies were good!!! Not like this generation! No, no, no! I bet their Guy Ritchie directed genies don’t even do copious Rodney Dangerfield impressions and then break our hearts with the beauty of their acting when they get their freedom! Pshaw, say I! Pshaw! The new Genie. What a creep. Well, you can watch the teaser for the movie above, which premiered during the Grammies, and you should and must give us your opinions on the new freakish looking genie in the comments or on Twitter at @WhatsTrending. Also, do you want to see our video about a make up artist who transform himself into Disney princesses, check out our video about that below.